Print your own logo on any of these reusable bags! High quality printing and the lowest minimum order quantity available anywhere! Minimum order starts at 600 bags for non-woven material. Contact us now for a competitive price quotation. Description: A best seller! These reusable bags are 100% recyclable, non-toxic, light weight and hypoallergenic. Each bag holds the equivalent load of 3-4 plastic bags or 2 large paper bags. Four or five reusable bags will hold the contents of a completely filled grocery cart. These bags have full-length handles which are designed to last up to 2 years of weekly usage and has been laboratory tested to hold up to 80lbs. Standard-sized dimensions: 15" (H) x 14" (W) x 8" (G) Handle Length: 24"
Standard Imprint Area: 5" x 5"
Description: These reusable bags are 100% recyclable, non-toxic, light weight and hypoallergenic. Each bag holds the equivalent load of 3-4 plastic bags or 2 large paper bags. Four or five reusable bags will hold the contents of a completely filled grocery cart. Standard-sized dimensions: 15" (H) x 15.8" (W) x 4.5" (G) Handle Length: 24"
Standard Imprint Area: 6" x 6"
Unique Bag Shapes! And Compact! Compact Reusable Bags that folds up into unique shapes! Current designs available: Strawberry, Orange, Watermelon, Emoticons, Heart, Rainbow, Soccer ball or Hockey Puck. Standard-sized dimensions: 15.5" (H) x 15.5" (W) Handle Length: 19.5"
Description: These reusable bags are made from environment friendly bamboo material. Durable. Fashionable. Washable. All-natural! Enough space to hold equivalent of two plastic shopping bags.100% recyclable, non-toxic, light weight and hypoallergenic. 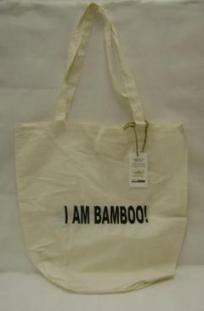 Standard Imprint: I AM BAMBOO (imprint included in price)"
Description: These reusable bags can have full graphic printing on all four sides! Made with up to 35% recycled material. 24" standard 'cross-stitched' over-the-shoulder handles. Self-standing for easy loading and unloading. ic, light weight and hypoallergenic. Each bag holds the equivalent load of 3-4 plastic bags or 2 large paper bags. Four or five reusable bags will hold the contents of a completely filled grocery cart. These bags have full-length handles which are designed to last up to 2 years of weekly usage and has been laboratory tested to hold up to 80lbs. Dimensions (as pictured): 13" (H) x 17" (W) x 6" (G) Handle Length: 24"
Description: Durable and lightweight, these bags are great for shopping and for promotional. Bag design can be any size and have full graphic control on all for sides of the bag. Full colour process printing is only limited by your imagination. Dimensions (as pictured): 14" (H) x 12" (W) x 4.5" (G) Handle Length: 20"